Twister kills 10 in Mexico border city as flooding wreaks havoc on Texas, Oklahoma. 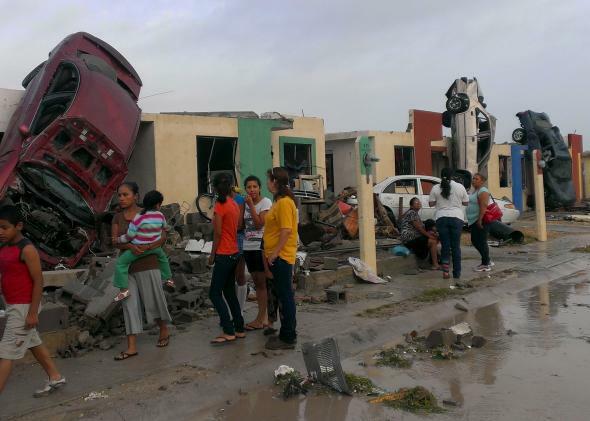 Residents stand outside their homes as damaged cars are seen after a tornado hit the Mexican town of Ciudad Acuna, state of Coahuila, on May 25, 2015. A powerful tornado ravaged a city on the U.S.–Mexico border on Monday, “destroying homes, flinging cars like matchsticks and ripping an infant from its mother’s arms,” reports the Associated Press. Across the border, the governor of Texas declared states of disaster in 24 counties due to the flash flooding that has killed at least three people, while at least 12 remain missing. One of the dead was a firefighter in Oklahoma who was swept into a storm drain while he was trying to evacuate a 5-year-old’s birthday party, according to Fox News. “He’s our hero. That’s for sure,” the 5-year-old’s grandfather Steven Darnell told Fox 23. In Hays County near Austin, as many as 400 homes were washed away by the flooding, reports CNN. “We do have whole streets that have maybe one or two houses left on them, and the rest are just slabs,” said Kharley Smith, emergency management coordinator. Although the storms in the U.S. appeared to be calming down on Monday, the National Weather Service warned in the morning that severe thunderstorms would continue to strike the region. Officials warn the number of missing could still rise in Texas, notes the Austin-American Statesman.